Stephan Kurt Westmann was featured in BBC2's 'Great War Voices'. 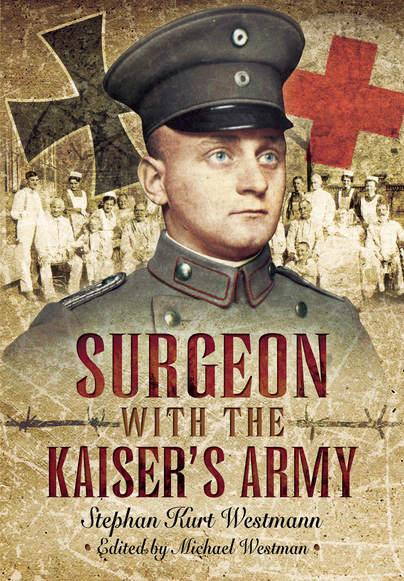 You'll be £19.99 closer to your next £10.00 credit when you purchase Surgeon with the Kaiser's Army. What's this? The Author gave up his medical studies at Freiburg University in 1914 to enlist in the German Army. He was soon involved in bloody hand-to-hand fighting against the French before moving to the Russian front. Promoted to medical officer, despite being unqualified and barely into his twenties he is given command of an ambulance train on the Western Front. He treats and operates on wounded of all nationalities and ranks and rescues British and German soldiers after gas attacks on the trenches of the Somme. As medical officer to the German Air Force (von Richthofen Circus) Westmann sees the dangers and effects of aerial combat at first hand. He witnesses the British tank attacks at Cambrai. His writing graphically illustrates life and death in the front line, the carnage and humour that sustained soldiers of all nationalities. Westmann's insights into the social, political, religious, economic and medical aspects of war time life are particularly revealing. The text is enhanced by contemporary photographs. This lively, opinionated, and often wry narrative provides a wealth of graphic detail about the rough end of warfare... The book brims with memorable stories and offers a number of intriguing insights into the memory, world view, and identities of its author at the time of writing. This excellent memoir is a book readers will seriously want to consider adding to their bookshelf... Stephen Westmann's superbly written account provides a unique perspective of the war and makes this both an engrossing and a fascinating read. Definitely not just another book about the First World War. An enthralling first-person account from the German side of life and death in an inhuman war told with humanity, and at times grim humour. Totally readable and gripping. Stephan Kurt Westmann, born 1893, eventually qualified as a Doctor in Berlin. An outspoken anti-Nazi he fled to Britain in the 1930s and set up a Harley Street practice. During WW2 he ran an Emergency Hospital near Glasgow becoming an Honorary Colonel. He died in 1964. Editor Michael Westman is the Author's grandson. He pursued a business career before becoming a Housemaster at Rossall School and then Headmaster at the British International School in Shanghai. He now lives on Skye where he has started a flying school.